Bitter Brook's cab cutting class! A short introduction to cabochon cutting! One of the posters at the Jewelry Artists Forum asked for some before & after photos of cabochons, so I thought I'd add this page so you could see what's it like cutting cabochons. Some days the most difficult times I have are deciding which slabs to cut. My shop has enough rough to last me three years or so, so I have lots from which to choose. 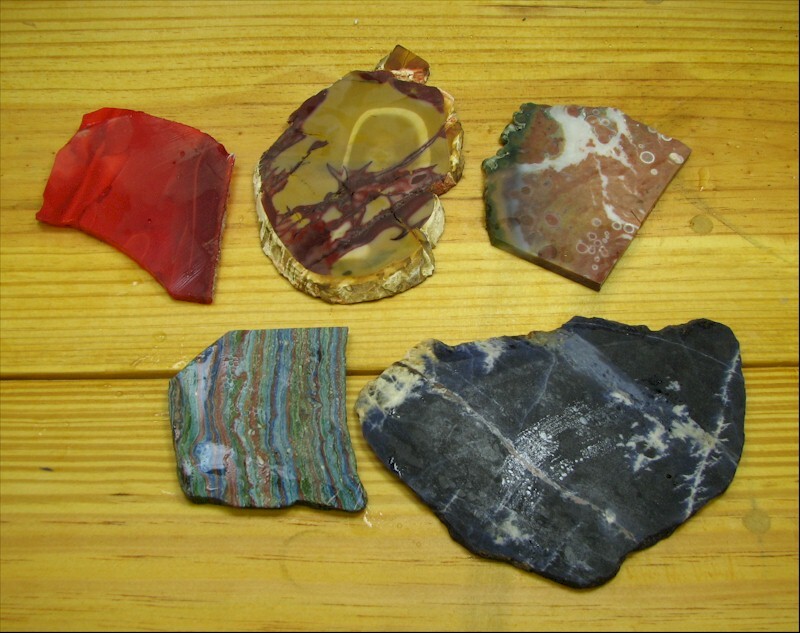 Here's the group I picked out for possible cutting today: Colored Glass, Mook Jasper, Ocean Jasper, Rainbow Cal Silica, and Sodalite. Here's the lucky candidate! 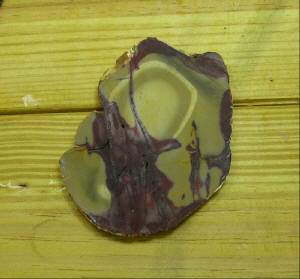 A nice piece of Mook Jasper from Australia. If I had the equipment to polish slabs, this slab would be a great candidate for a display; it has an eerie landscape with a pale yellow sky and a big angular sun in the sky! Not to be, this puppy is about to be scored, sawed, and cut & polished. Sadly, while very cool as a yellow sky in a large picture slab, the yellow portion is pretty boring in cabochon-sized chunks. The dark parts at the bottom of the slab will get cut another day. For now, the portion at upper right, with the bold red streak, looks good to me. Natural features of the slab guide my decision. 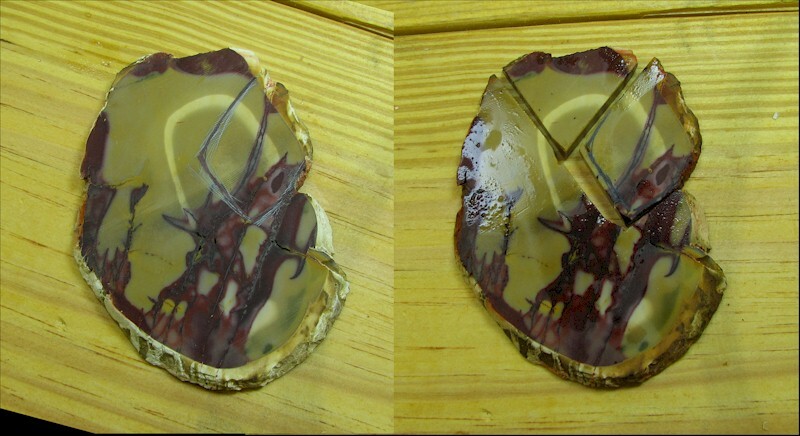 In the left-hand photo, along the lower right part of where I've marked, you can see a fracture; at the bottom point of the future cabochon extending downwards and right, is another fracture. Mook has fractures; some are pretty stable, like the dark streak which led me to the cutting decision, but others are just troublesome. The features in the slab, then, "help" the lapidary decide what to do next. Sam Silverhawk, undoubtedly the most gifted cab cutter in the world (my opinion), calls this "letting the rock talk to him." In the right-hand photo, you can see where I've cut my preform from the slab. Pretty, huh? Let me digress. The machine on the left is made by Diamond Pacific in California; it is their "Genie" model grinder-polisher. It has six six-inch x 1-1/2 inch wheels; the first two are diamond grinding wheels (80 & 220 grit), the next four are Nova sanding & polishing wheels (280, 600, 1200 & 3000 grits). 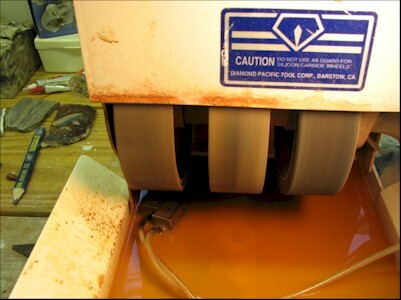 I use a 50,000 grit wheel as my final polishing wheel. DP sticks a $2,150 suggested retail price tag on these beauties; discounts are available if you're patient, and they occasionally show up in auctions & elsewhere as used equipment. Make sure the wheels are good, though, or you'll drop an additional $600+ to buy a new set. All that said, this is the best G/P machine on the market for someone to do some serious cabbing with. All grinding & sanding is done "wet," with air-fed geysers shooting water up from the plastic trays. Run your Nova wheels dry for too long and you kill them! The filthy, rock mud-covered thing on the right is a little tile saw from Home Depot that is my main trim saw. I've added four-inch diamond cutting blades to this no-name machine and it does a very good job for less than $50. Another dirty-looking thing! This is a vintage dop wax heater made by Ray-Tech. 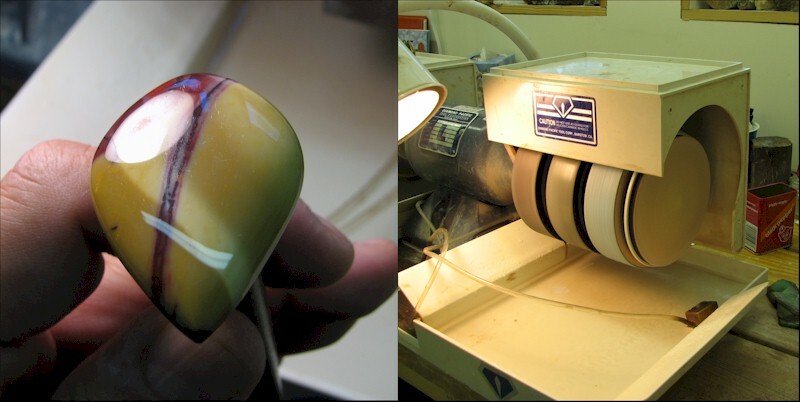 A 100-watt light bulb inside melts dop wax in a small reservoir. Dop wax secures the preform to the dop stick for working on the G/P machine. On the left, you can see the preform heating up on the dop wax heater; this helps the wax to hold. On the right is the dopped preform sitting on a small rock slab to cool. If you get in a hurry and work the preform before the wax cools, you'll lose the preform when the still-soft wax gives way. I get the preform oriented on the dop so the the bottom plane of the preform is perpendicular to the dop stick (or just plain dop, for short). First thing to do is get the dome started. On the 80-grit wheel, cut around the top of the preform in a 45-degree or angle. I leave a little (1mm or more) waist around the preform (shown at left) which makes the cabochon easier to wire wrap, but in this case I decided to round the edges. But I still start with the straight-sided waist. I got from here to the photo on the right by cutting around the top in successively lower angles to approximate a dome on the cab. With a hard rock, the 80-grit wheel is the one I'll get most of the shaping done. Softer rocks like Sodalite, Lapis, and Rhyolite will get shaped on the 220-grit wheel. In the photo on the right, you can see wet & dry areas on the cab. 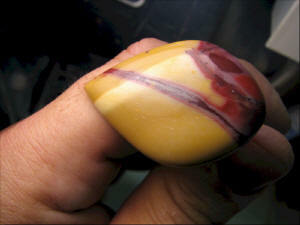 Although it's too early to make a difference at this stage, ALWAYS evaluate your cabochons for scratches DRY. Water hides the scratches, and it's a b*tch to get all the way to final polishing before noticing a scratch. That said, you can more easily determine if you dome is really domed (with no flat spots) if the cab is wet. But a scratch will kill a cabochon just a quickly as a flat spot. You can also see in the right-hand photo that the flat edge is just about rounded off. This is done by working the cab in constant motion across the grinding surface. Nice, Huh? These photos show the shaped cabochon after working the two grinding wheels and the first, 280-grit, polishing wheel. Each wheel, as you progress left-to-right along the Genie, has the added job of removing scratches put in the cab by the previously-used wheel. The two grinding wheels will put gazillions of scratches in the cab; your job as lapidary is to get them all out with the 280-grit wheel. No, you won't get them all the first time; yes, you'll have to frequently come back to the 280-grit wheel (and sometimes to the 220-grit wheel). Besides looking nasty, dirty water in your reservoir has rock grit floating in it which will SCRATCH YOUR CABOCHONS! Clean your water reservoirs frequently; refill them with clean tap water. And don't move a cab directly from one wheel to the next without cleaning it off (rinsing or wiping). Click on the photo for a closeup; you will see lots of small scratches on the bottom part of the cab. Notice that the cab is DRY; you won't see those scratches on a wet cabochon. 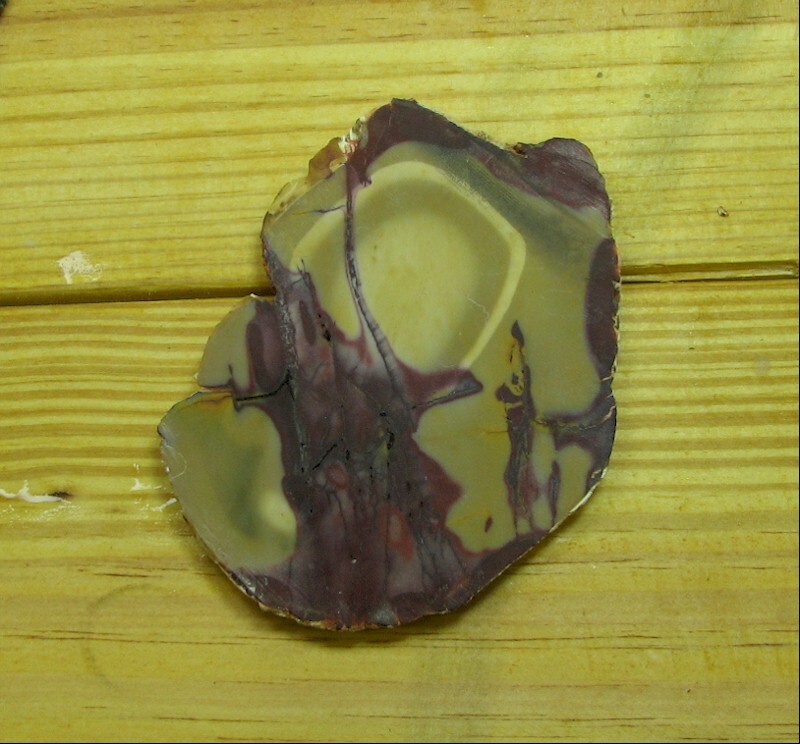 Note the fracture in the cabochon. 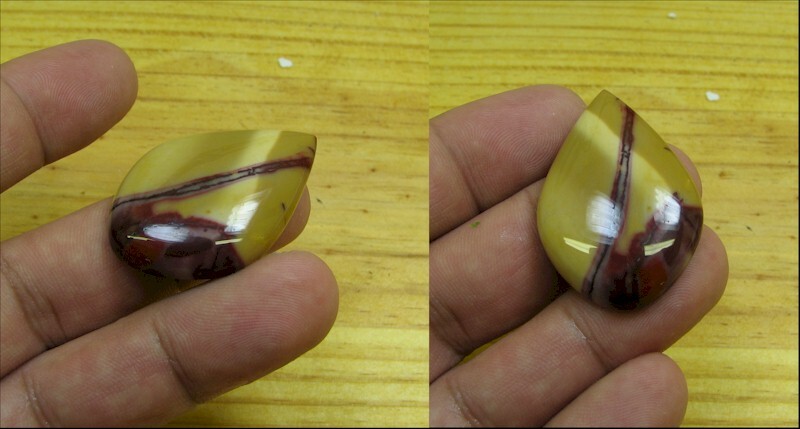 Sometimes, with a Mook Jasper, I put some Super Glue along the fracture and polish it down just for appearance's sake. It'll look fine. I always check large fractures to be sure they're stable; if the cab doesn't break in two when I twist it & tweak it, that's a bonus! The photo on the right shows a fabric polishing pad which I use for final polishing with either Tin Oxide or Cerium Oxide. I used to have a link here to a short movie I took while moving this cab back and forth so you could see the cabochon's curvature by clicking a link in a little bit. It was 13 seconds and was a 9MB file. Way too big for 13 seconds, so I removed it. You can always see shiny new cabs by clicking here. Here is the finished cabochon! Pleasing freeform cut, nice shine, with no flat spots. Here are more rocks to cut. 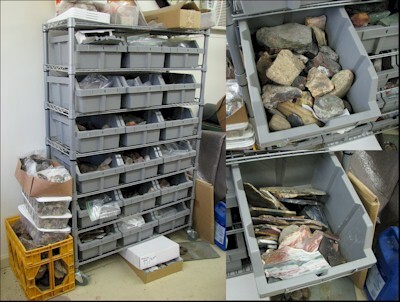 Lots more rocks, enough to last at least three years! They're in bins and boxes, on the benches, under the benches, and outside the shop. I hope you enjoyed this quick lesson in cabochon cutting. If you have any questions, please e-mail me and I'll try to answer. You are visitor number 275 to this page this year.